From Sept. 1-14, Walgreens locations in Central Illinois will be launching a fundraising campaign to benefit Special Olympics Illinois. View list of participating stores. During the two-week fundraising time period, patrons of Walgreens stores will be encouraged to purchase a scannable in donation amounts of $1, $3 or $5. Customers can write their name on the donation and Walgreens will post it in their stores, as a means of also raising awareness for Special Olympics Illinois athletes. John Davis and his volunteer crew from Walgreens serve lunch at East Central/Area 9’s Spring Games. Walgreens stores in Central Illinois have partnered with Special Olympics Illinois thanks to the passion, community concern and volunteerism of John Davis, District Manager of Walgreens Area 94. Davis encouraged his co-workers and Walgreens employees to get involved and volunteer for the SOILL East Central/Area 9 Spring Games held annually at Eastern Illinois University in late April/early May. 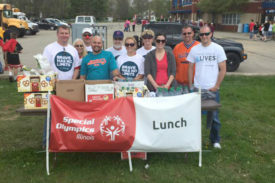 Davis and his crew of volunteers from Walgreens coordinated the lunches for more than 1,000 athletes, coaches and volunteers at the Spring Games every year since 2014. In 2015, Davis again stepped up to the challenge of recruiting Walgreens employees to volunteer as a group for coordination of parking at the Lake Sara Polar Plunge in Effingham. Since then, Davis and his team have continued to organize and coordinate parking and shuttles for the Polar Plungers. The money raised during this campaign will go directly to Special Olympics Illinois to benefit programs including traditional sports, Unified Sports programs and the Healthy Athletes initiative. Please join Special Olympics Illinois in thanking all of the Walgreens team members by stopping by your local store and showing your support.